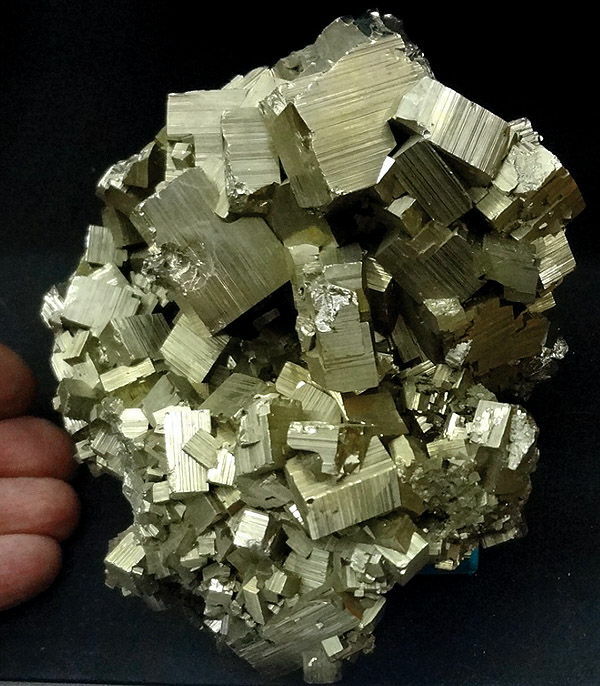 Name "Pyrite" happened from Greek, "pyr" is a fire, because at the blow of mineral emits sparks. The name "Marcasite" used sometimes is wrong: veritable Marcasite is polymorphic modification of Pyrite, not suitable for treatment which on air easily oxidizes and scatters in powder. Disseminations of Pyrite in a rock glance (glitter, glare) "as gold", and in the people of him sometimes name cat-like gold and gold of fools. Often there are well well-educated crystals with strong metallic brilliance. Pyrite is a yellow mineral, found in igneous and metamorphic rocks and in veins. It is a source of sulphur and is used in the manufacture of sulphuric acid. Composition: iron sulphide. Formula: FeS2. Crystal structure: cubic. 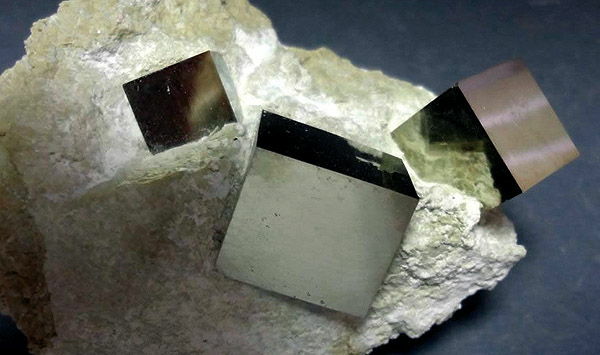 Also called: iron pyrites, pyrites. Nontechnical name: fool's gold. Etymology: from Latin pyrites flint, from Greek purites (lithos) fire (stone), that is, capable of withstanding or striking fire, from pur fire. A Pyrite is widespread everywhere. Inca used a Pyrite as mirrors (Inca a member of a South American Indian people whose great empire centred on Peru lasted from about 1100 AD to the Spanish conquest in the early 1530s and is famed for its complex culture). Presently a Pyrite is cut shallow roses or used as an accompanying stone in place of shallow diamonds. Pyrite - easily recognizable and widespread mineral. Known from antiquity. Often there are crystals of perfect form. His blocks with smooth or with shading easily knowable verges. Sometimes their tops are cut away the three-cornered verges of octahedron. Also there is a pentagondodecahedral form; in this case separate pentagonal verges are not equal to each other. Twins are widespread, but to recognize them enough hardness. 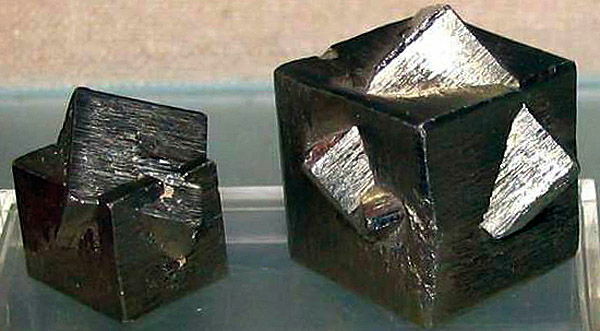 A double in form "ferrous cross" is typical combination two pentagonal-dodecahedron. Due to a brass-yellow color, metallic brilliance and absence of cleavage a Pyrite is reminded by gold. But a Pyrite oxidizes easily unlike him; it is more hard (does not scratch a knife). In moist terms it decomposes, forming sulphuric acid and other products (brown-black oxides gland and white fibred sulfates). Under the action of fire a Pyrite burns blue flame with a strong smell sulfur (sulphur, brimstone). Entangling him is possible with gold and chalcopyrite. Pyrite - very widespread mineral, able to appear in different geological terms, foremost in hydrothermal vein, lode, mines together with other sulfides; also in metamorphic rocks - serpentinite and granular limestone, marble. 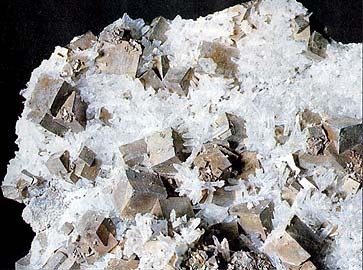 Almost always it forms perfect crystals, although also there are massive aggregates. Be found enough often all over the world. Deposit minefield mine field occurrence subsoil of jeweller Pyrite are on Elba (Italy, EU). From a Pyrite get produce iron and sulphur. At incineration get oxide iron from which extract a metal. Sulphur after combustion is restored and get sulphuric acid which is used in many industrial processes. 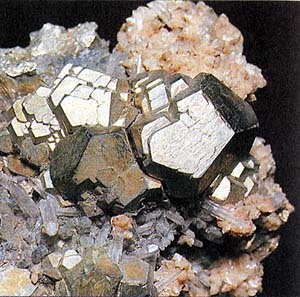 Pyrite (crystals to 2 sm) in a maternal rock. Navakhun, Spain (EU). A photo: © A.A. Evseev. Pyrite. 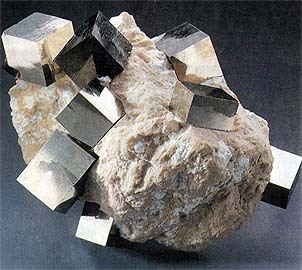 Cuboidal, cubicalof Pyrite. Berezovsk, Sr. Ural, Russia (Russian Federation, CIS). A photo: © A.A. Evseev.